Lead Paint – Many people don’t think about the dangers of lead-based paint in some of the homes that they own or about to purchase, especially houses built before 1978. Lead causes nervous system damage, stunted growth, and delayed development. If you think it’s too dangerous to deal with lead paints, then it’s better not to use it. However, there are so many other items used in homes that are naturally dangerous. Learn more about lead paints if you’d like to use them anyway. A google search can greatly help here. So why was lead paint actually used in the first place? How About Low VOC Paint? Well, the main reason was to help speed drying, increase durability, retain a fresh appearance, and resist moisture that causes corrosion. 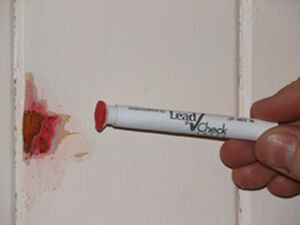 Although lead improves paint performance, it is a dangerous substance! Lead has become an issue not only because it is an ingredient of paint. But also it’s been used in other materials such as toys and school supplies. And these have the same issues; lead has been known to poison a lot of people. In the interior of buildings that are much older as well as in other details such as the doors, ceilings, cabinets and doors, lead has been used until it was banned in 1978. This is since it has been proven to cause several sicknesses in children and also in adults. Dealing with this problem can be very costly that some owners who do not care much would not deal with the problem at all. Thus causing a threat to all the people who would be exposed to the surfaces that are painted with lead paint. 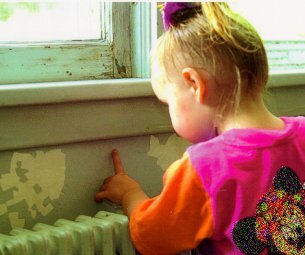 According to a study, exposure of people to lead paint can cause several mental and physical disorders that can prove destructive as it develops. For pregnant women, exposure to lead can cause abnormal development of the fetus. Lead poisoning can cause a lot ranging from kidney problems in children or in adults to an increase in blood pressure. In most cases, people would try to remove the cause by scraping off the harmful layer of paint. And then applying a new layer. While this would be the easiest way, you should NEVER try to do this. 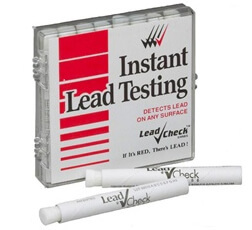 The first thing to do is look for a good lead paint testing kit on the market as shown in this diagram. This particular kit contains 8 disposable swatches and is very easy to use. A positive reading of lead paint will basically turn the swatch to red. Scraping off the layer off could cause particles to go flying into the air and those particles can poison anyone who would inhale it. Instead, try to cover the harmful layer with something like a wallboard or wallpaper and paint that layer. For doors, cabinets and other small parts, it would be best to have them replaced entirely. You would not want to risk anything regarding health. And for this, the safest way is to have the entire thing removed. While that may sound very costly, it pays to be sure of everyone’s welfare. With the threats imposed by these issues, you might not want to risk your own welfare. And luckily, there are professionals that are certified for the removal and have the proper training and equipment. These people already know what to do and can give you advice on how to maintain it. So, with that, you can already fix the issues without doing things yourself. With the experience and capabilities of these people, hiring them could be the best option for you. While it may cost you a little extra, it’s a small price to pay for the safety of you and your family. Firstly, VOC actually stands for “volatile organic compound”. These are the chemicals in paint and in paint pigments that are harmful to the environment. They release from the paint into the air (even up to 5 years) and are harmful to our own health as well as the environment. Historically, paints and a lot of solvents on the market contain VOC’s. But with rising concerns about the environment and regulation changes, many of the paint industries are now producing non-toxic paints. A low VOC paint is usually rated at having less than 50 grams of VOC per litre. There are also paints that are classified as Zero VOC paint which has less than 5 grams of VOC per litre. What I’ve learned being in the painting industry is that “some” of the paint outlets around say they offer Zero VOC paint. But as soon as they add any color to the paint, boom – your VOC level goes back up! Yes, the pigments used do have VOCs as well. Now there are some vendors that have zero VOC in their pigments. And it’s always a good idea to ask this question when this is important to your situation, i.e. new baby room to be painted. What is an acceptable VOC level in paint? Well, according to the Canadian and US governments, the acceptable level is 100-250 grams per litre. I’d be looking for paints that are less than 50 grams. The lower, the better of course. 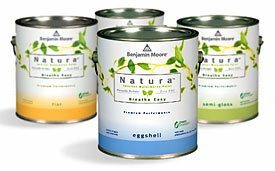 Most paint manufacturers now produce one or more low and/or zero VOC varieties of paint. These new paints are durable, cost-effective and less harmful to human and environmental health. The amount of VOC’s varies among different low VOC paint products and is listed on the paint can. These paints will still emit an odor until dry. If you are particularly sensitive, make sure the paint you buy contains fewer than 25 grams/liter of VOC’s. Do your part in going green – the next time you are painting your house or even one room, choose a low or zero VOC paint. You’ll have the satisfaction that you are helping not only the environment but the health of your family!